Welcome to Forge Cottage, brought to you exclusively by Character Cottages, local specialists in stylish Cotswold holiday rentals. Forge Cottage is a lovely Cotswold stone property, managed by the neighbouring Guiting Guest House. The cottage is in the centre of the beautiful and peaceful village of Guiting Power, which is surrounded by the stunning countryside of the North Cotswolds. Guiting Power remains a traditional Cotswold village, with friendly locals who live and work in the area, creating a lovely sense of community. It benefits from two well-regarded pubs, which are in walking distance of the cottage, as well as a bakery which stocks local provisions and a Post Office with tearoom, serving food throughout the day. For families, there is a lovely park with playing field, swings, sand pit and a zip wire. The well known market towns of Stow-on-the-Wold and Bourton-on-the-Water are both approximately six miles away and the cottage is well placed for exploring the entire Cotswolds region. 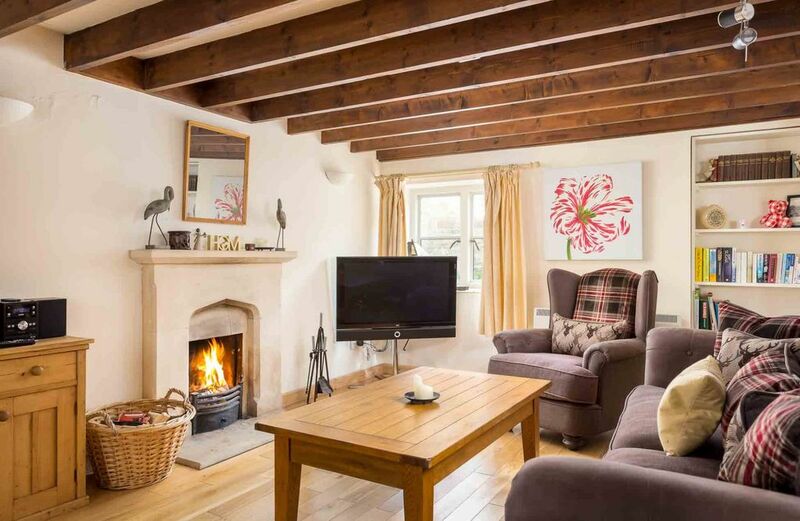 The cottage has been enhanced by its current owners, whilst maintaining its traditional character, including wooden beams and floors, and a real fire. The character of the cottage is complemented by its modern facilities, including wireless internet access, a Freeview TV and a well presented kitchen. The cottage sleeps a maximum of five guests (one on a "Z" bed), in two bedrooms, with two bathrooms. Quiet on street parking is freely available. Forge Cottage is an ideal retreat for friends, couples or a family, looking for a peaceful getaway in a beautiful village. If you would like to read more about the property’s features, then feel free to get in touch by searching the web for Forge Cottage Character Cottages! Thank you for your lovely review of Forge Cottage. It's great to hear that you had a wonderful stay and that you found the property to be well equipped. We do hope you will come back for a visit again soon! Thank you for your glowing review of Forge Cottage. We're please that you had a great long weekend away and that you found the hosts to be very welcoming! We hope that you will be happy to visit again soon! Beautiful cottage in a beautiful village! We had a fantastic stay at forge cottage. It had everything you could possibly need. We even had the added bonus of beautiful weather which was great for February. The Cotswolds is truly stunning and we will definately be back. Thank you for your lovely review, Samantha. We are so pleased to hear that you enjoyed your stay at Forge Cottage and that the weather was delightful. We hope to see you again soon! Thank you for your lovely review, Gerald. We're pleased to hear that you enjoyed your stay at Forge Cottage and we hope that you visit again soon! Forge cottage is a great holiday home for a family break. It has a welcoming and cosy feel, with everything you need for your stay on hand. The only thing we missed as a family of 5 was a washing machine. However, the bedrooms were great with comfy beds and lots of great storage provided by some lovely antique furniture. The village has a fab playground for children with zip wire and sand pit, a tea room and two great pubs. Some picturesque local walks also help to make this place the ideal holiday base for relaxing. Thank you for your delightful review of Forge Cottage, Elaine. We're pleased to hear that you had a great family break and that you enjoyed your stay. We hope you visit again soon! Quite location excellent meals in the farmers arms which is just a two minute walk from the cottage. Plenty of places to visit. Car: Forge Cottage is easily accessed by car, being located approximately six miles away from both the A429 (Fosse Way) and the A40, which are two of the main roads running through the North Cotswolds. Train: The nearest railway station to Forge Cottage is Kingham (approximately 12 miles away), which has regular, direct services to London Paddington, with a typical journey time of less than 90 minutes. Plane: Birmingham International Airport: 48 miles, approximately 75 minute drive; Heathrow International Airport: 80 miles, approximately 100 minute drive; Bristol International Airport: 61 miles, approximately 85 minute drive.